It is Saturday, July 7th at 7:00am, and the temperature is already an uncomfortable 84°F. Forecasts had the high temperature at well above 105°F. That, however, did not deter volunteers from Highland Fairview. 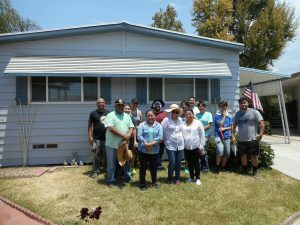 As these individuals arrived at The Meadows Mobile Home Park, it was clear that they were enthusiastic to help our friend Phyllis by applying a fresh coat of paint to her house. 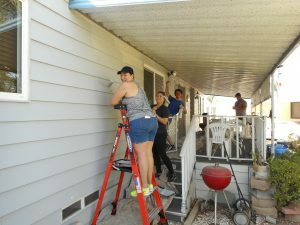 Braving the dizzying heat of the day, these volunteers helped Phyllis preserve her investment and portray an inviting exterior to match her warm personality. In short, this was not Highland Fairview’s first rodeo. At the end of a brief introduction, familiarizing them with safety practices, tools, materials, and the day’s objective, the teams quickly spread out to tackle their assigned portions of the project. Their almost contagious enthusiasm seemed to temporarily wick away the heat, as they quickly started on all sides, audaciously attacking the sunny side of the building with equal vigor as the shaded side. 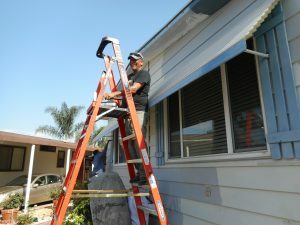 Rafael starts on the front of the home, with no hesitation cutting out the trim on top. 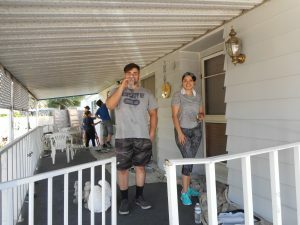 In merely a couple hours the heat had already risen to 103°F, highland Fairview and others persisted through the heat to finish much of the project. The team managed to keep spirits as high as the temperature with fun anecdotes about Wesley’s 16 years of martial arts experience, and debating the rankings of superhero films. The volunteers showing good spirit, hard work, and teamwork. Even though we did not finish the project that day, Highland Fairview showed a lot of perseverance and work ethic, contributing to the betterment of their community. 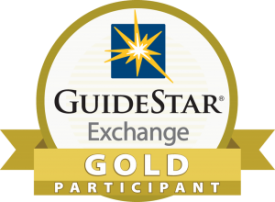 Your considerable efforts are appreciated! The good-looking group of Highland Fairview volunteers posing in front of the finished product. We look forward to working with you again (hopefully on a day that is not quite as hot). Just a reminder to anyone who works outside on these hot summer days—take care of yourself, stay hydrated, and watch out for your friends too. Volunteers taking a well-deserved water break, after working in 105°F weather.